I love egg cups. I find them somewhat impractical but I love the idea of using them. I think the shape is so pretty and the colors and designs are innumerable. What can be better than pretty egg cups than pretty egg cups for Easter? 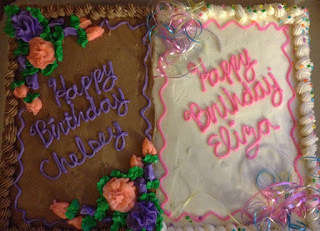 Think how cute these would look with little scoops of Easter colored ice cream. 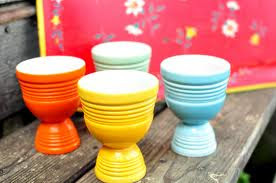 Egg cups would look cute with herbs planted inside, tiny candies, votives or as I use them...little holders for kosher salt and coarse pepper. Grab your Easter pastel fabrics, little lengths of ribbon or trim and be ready for a week of Easter Tutorials called Easter Bunny Blog Hop coming your way the first part of March featuring several blogs and hosted by Melissa Stramel. Here is a sneak peak of what will be in MY tutorial. (I really think they will look more like eggs in the cups once the sashing is around the blocks. I hope.) 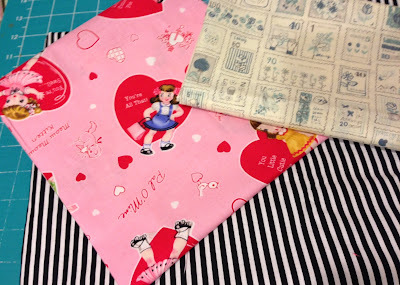 Riley Blake is sponsoring the Blog Hop with charm packs but I've been practicing with the above fabric until my charm pack arrives. I figure I'll make a few. 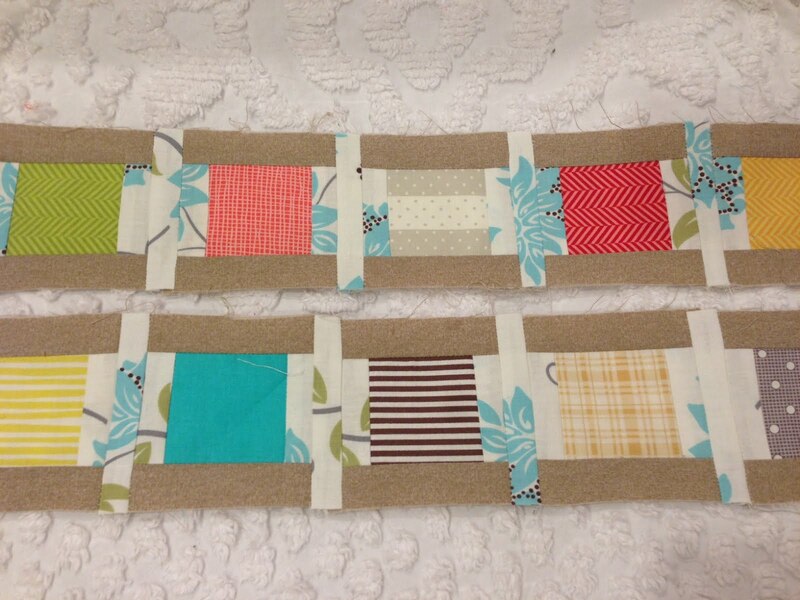 My project will be a table runner. I hope I haven't given too much away but that I've peaked your interest and you want to block out time to participate. 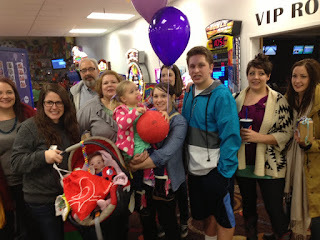 Sometimes there are those "stop the presses" events when you have to move everything to the side and make a gift. I consider those events a good time to challenge myself and try to make the most of my time and effort. A family member is expecting in May but found out they are moving with only a few days notice. 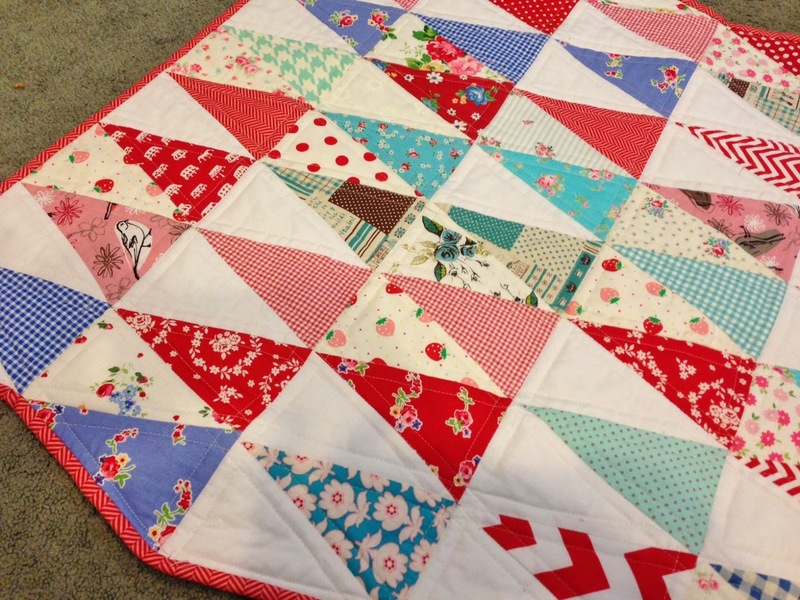 So it became baby quilt making time for me pretty much over night. 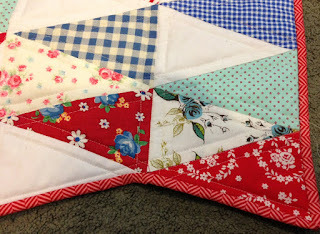 I had a few triangle fabrics cut out already so I decided to go with the red, white and blue color scheme and cut out more fabrics to go with what I had on hand. 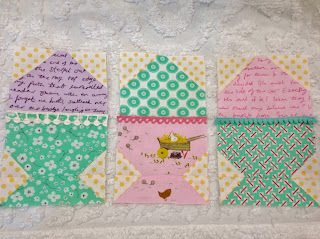 I added a few light prints into the white triangle areas just for a bit of whimsy. You can't go wrong with pretty fabric. 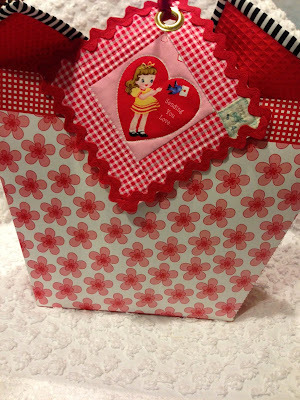 I used a pink/red houndstooth to bind it. I like the interesting shape the triangles create. 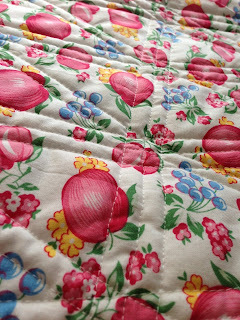 I machine quilted it myself using the shapes to dictate the straight line quilting. I was glad to have this apple fabric on hand to use for the quilt back. 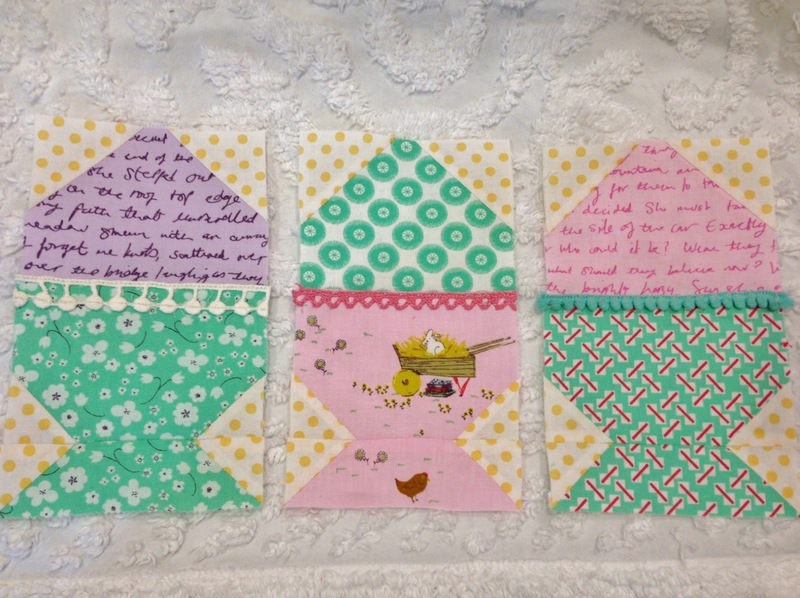 I hope they like and enjoy the baby quilt. 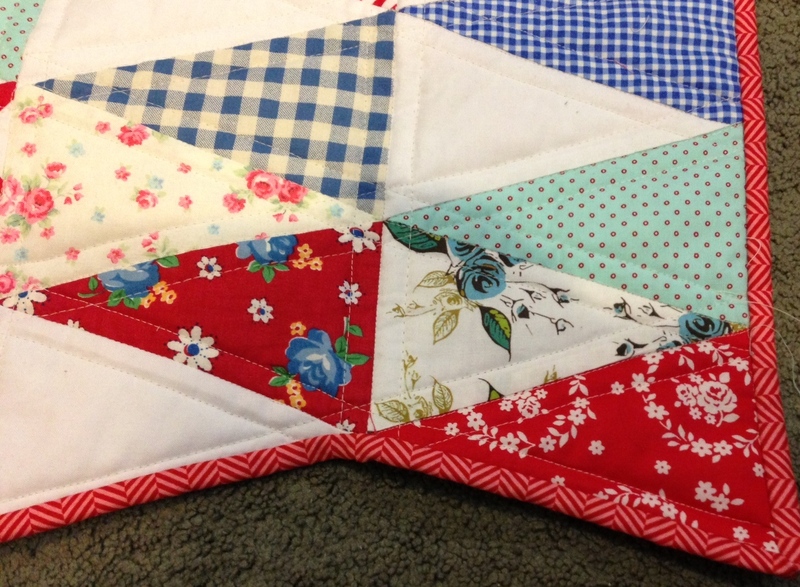 It was fun to make and no matter what, you can't have too many quilts for a first baby. Happy Valentine's Day to everyone . I hope you all can find a fun way to celebrate this silly little holiday. 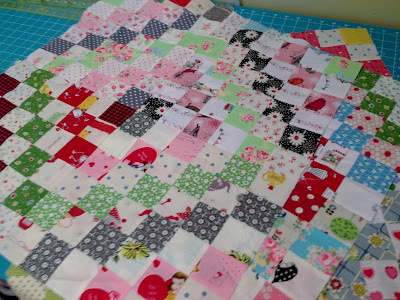 Today is the unveil of my Pam Kitty Love quilt called "I Heart Buttons and Bows". 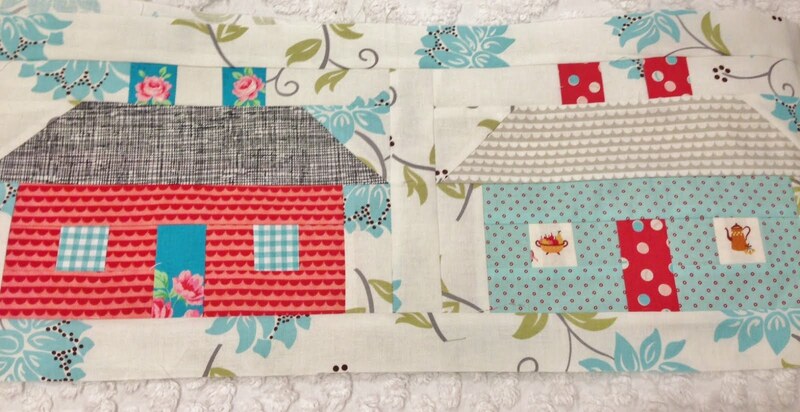 Thanks again to Pam for this really wonderful fabric and for sharing so graciously with me. I have enjoyed playing with the sweet designs so much. There was one issue with my finished product that caused me to hesitate writing the pattern. In the end this turned out to be a very non-distracting issue. I think I've overcome that problem now so I'm hoping to have a pattern up in a week or so for this very fun quilt. The quilt is full of hearts that can be for Valentine's day but also I love hearts all year 'round. 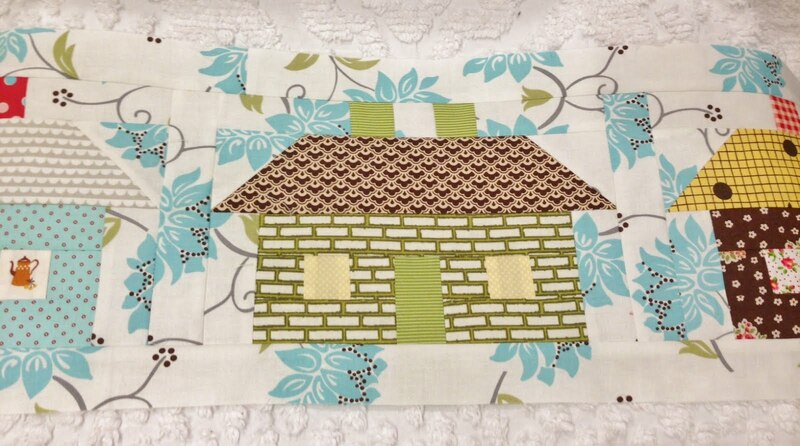 I'm been pretty proud of myself for keeping up with Lori's Row by Row quilt. I was able to get the latest row of spools done in just a couple hours over the weekend. The spools were very simple and are a perfect addition to the other rows. I used a brown gray solid for the spool. 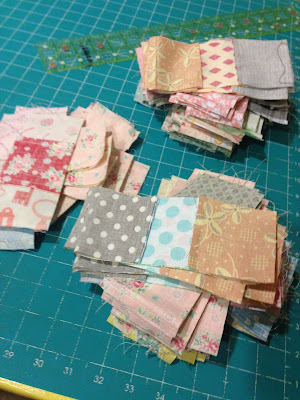 I looked through my fabric stash to pick fabrics that might imitate thread. 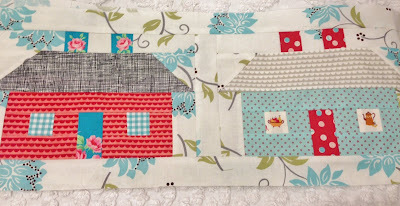 It was fun to add some new fabric choices to my rows. 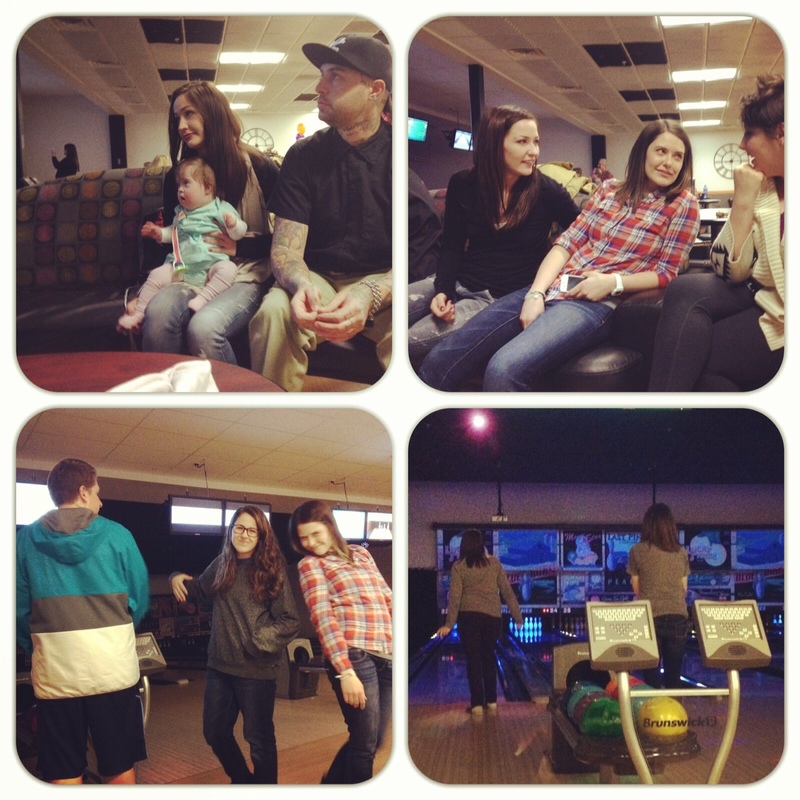 I think they all turned out pretty cute. 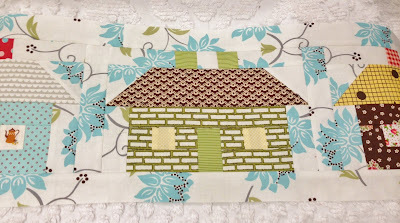 I made 10 houses from Lori's last block but after talking to her about the finished quilt being 70"x 90", I knew I really couldn't throw an extra row of houses into the equation So I picked my favorite 5 houses and stitched the sashing and bottom/top borders. So with the spools, I'm completely up to date. Check. 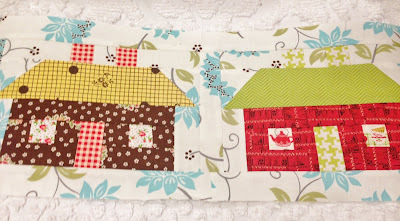 It was hard to choose which houses to use in the quilt but I'll figure out what to do with the other houses and somehow add them to the project. After seeing everyone's houses on blogs everywhere I know for sure this is my favorite row. I met Lori for lunch Friday. Even though it is her birthday she brought me a valentine gift. It is a sweet reproduction red topped square jam keeper. I love it. Lori packed it with Godiva chocolates. Yum. Thanks Lori. Lori's birthday is the 16th. Be sure to wish her a happy birthday this week. She came ready to show me what her next projects are and I'm very excited for her. 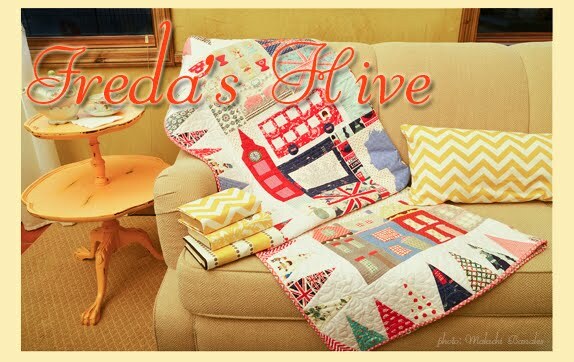 Just when I think she's come up with her best work, she tops herself with more exciting fabric and patterns. 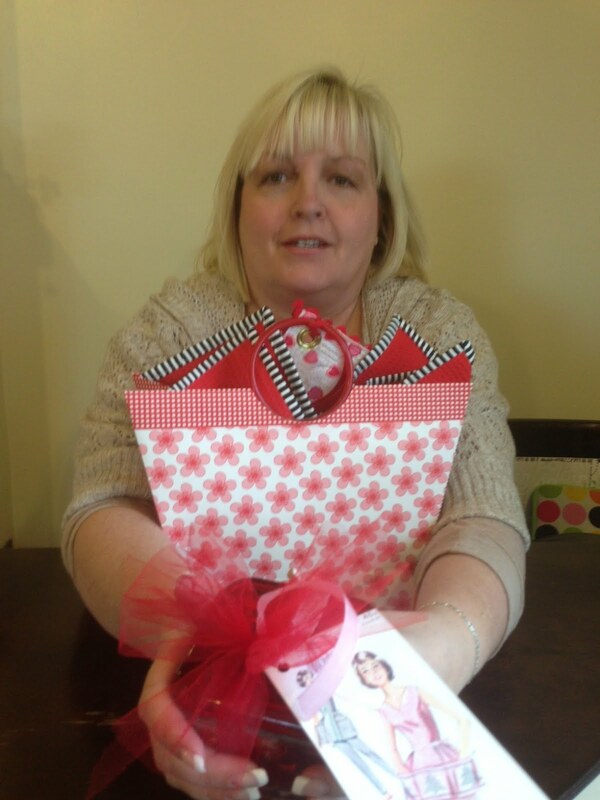 Lori has a fun spring ahead for us. I like stash fabrics. Those are fabrics I can pull off my shelf and make anything with when the inspiration or need occurs. 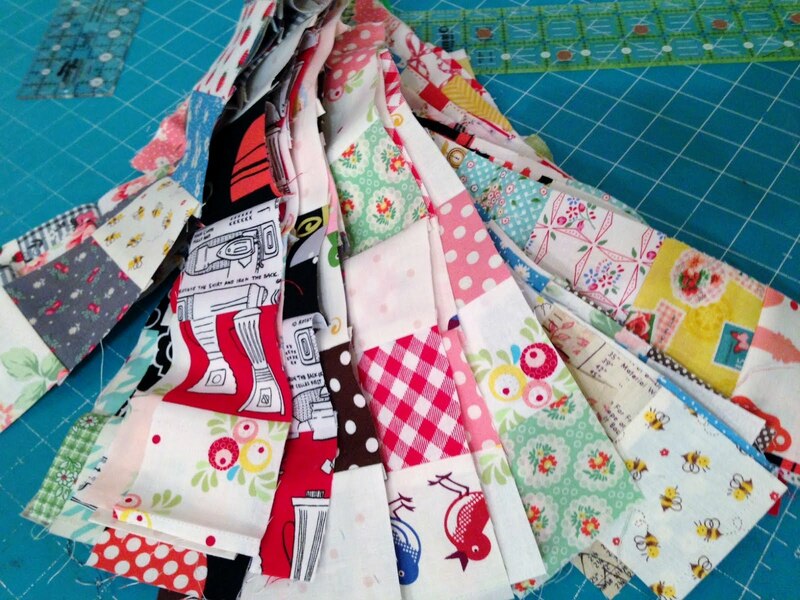 My stash consists mainly of small yardage from fat quarters to under a yard. Of course I have favorite pieces with larger yardage as well, but not as numerous. Valentine's Day is just 6 days away and in my head I imagine making fabric valentines for everyone I know. But let's get real. 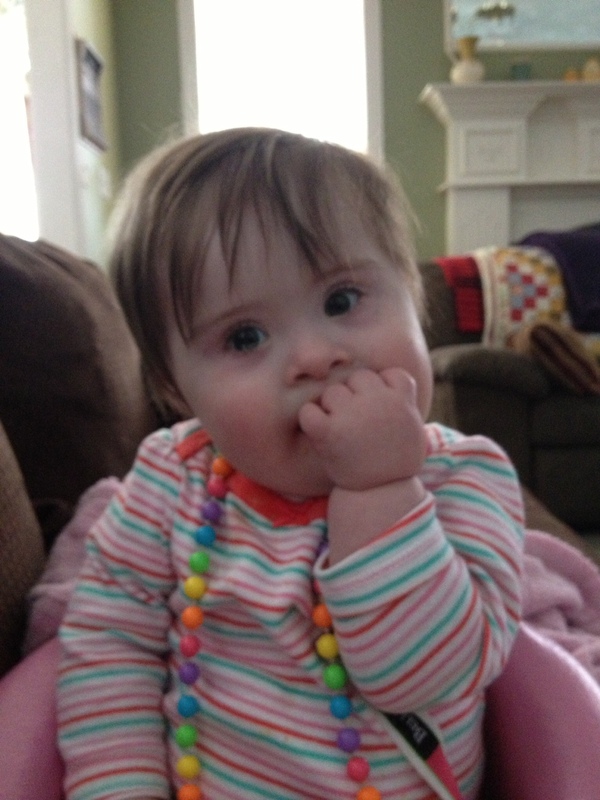 If I make a handful, I'm doing great. 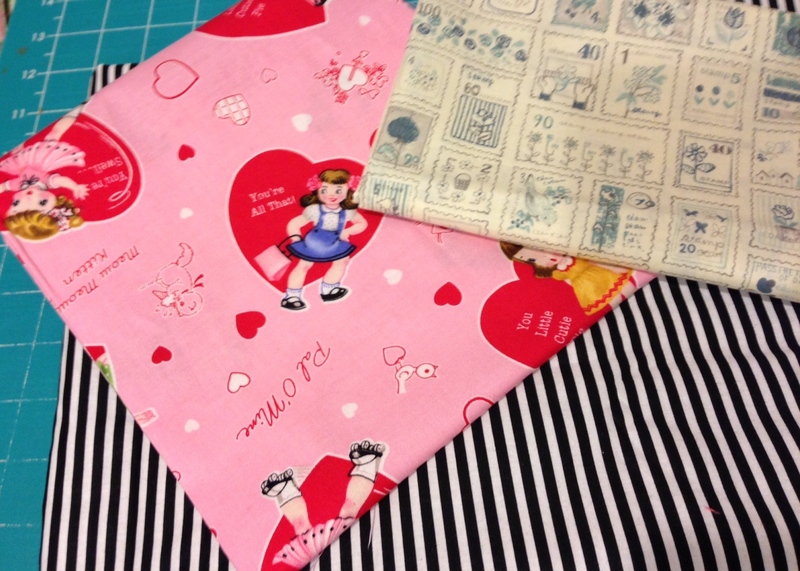 I pulled a few fabrics from my shelf to make a special valentine for a friend having a birthday very soon as well. I had a bit of red toweling left from other projects. 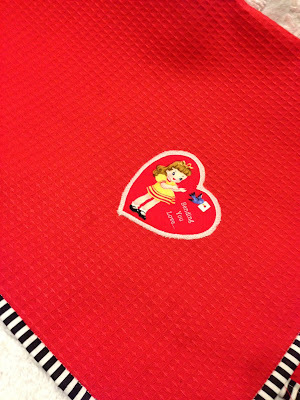 So I decided to machine applique a valentine from Pam Kitty Love fabric and I machine bound the towel with a black and white stripe. I think the stripe sets off the red perfectly. 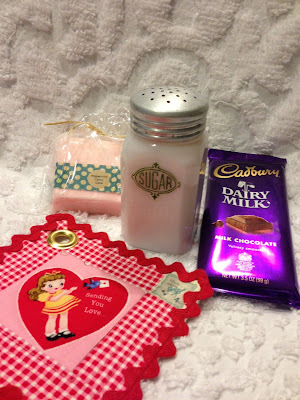 I also made a little valentine card tag. I fussy cut a valentine from Pam's fabric. 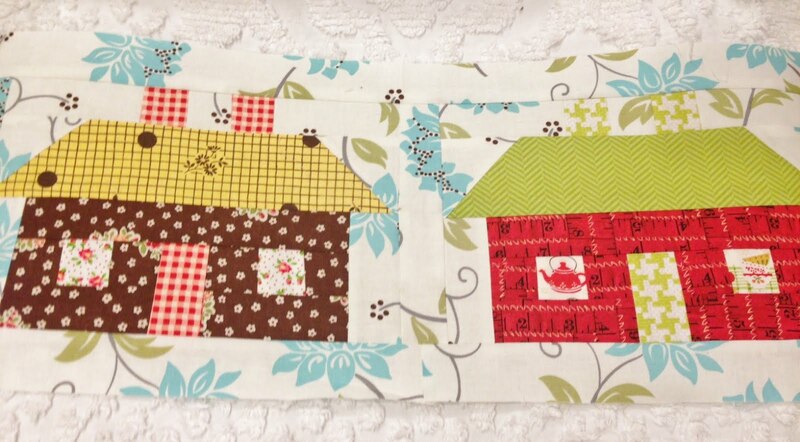 I also fussy cut a stamp from that stash fabric I showed above and stitched the stamp to the top border in the accent PKL check. 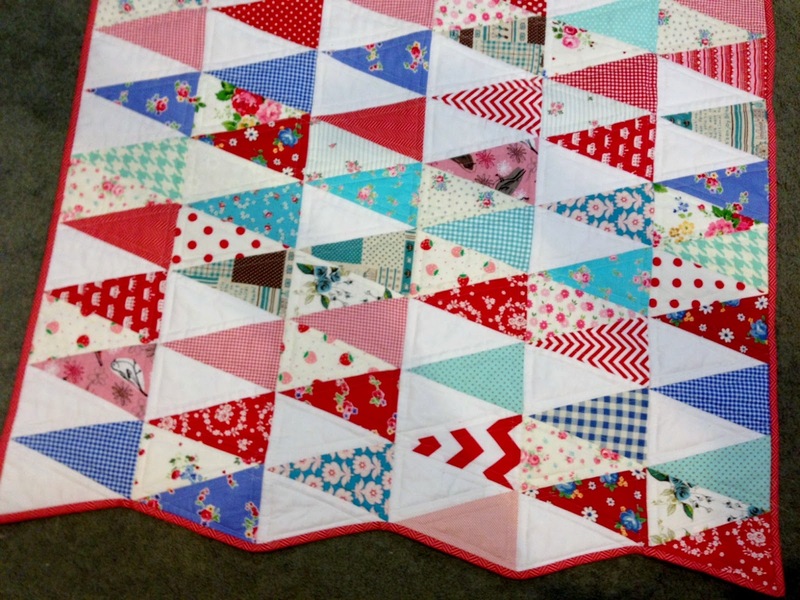 Then I sandwiched batting to a backing fabric and made some very basic quilting around the heart and in the border. I didn't bind the valentine. I thought binding would overwhelm the card. I just left the fabric card raw edged but I added a little rick rack to make it pop. Placing a metal ring will allow me to hang the valentine from the package and make it easy to hang the valentine for a later decoration. I'm meeting my valentine friend for lunch today at our favorite spot. She's very sweet so I decided to package sweet treats for her. I found a vintage sugar shaker that I thought was perfect. The little soap is peppermint candy scented. Of course I had to add my favorite chocolate bar for her. 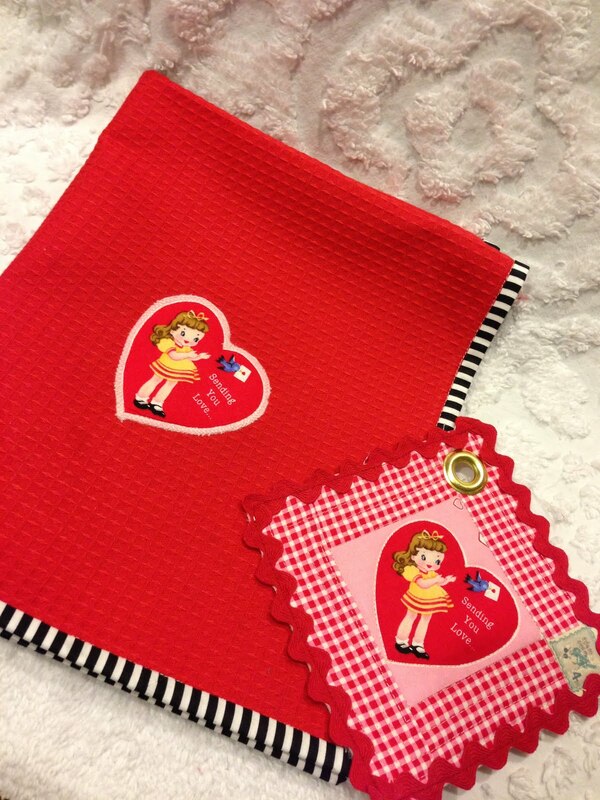 Do you know who this valentine gift is for yet? 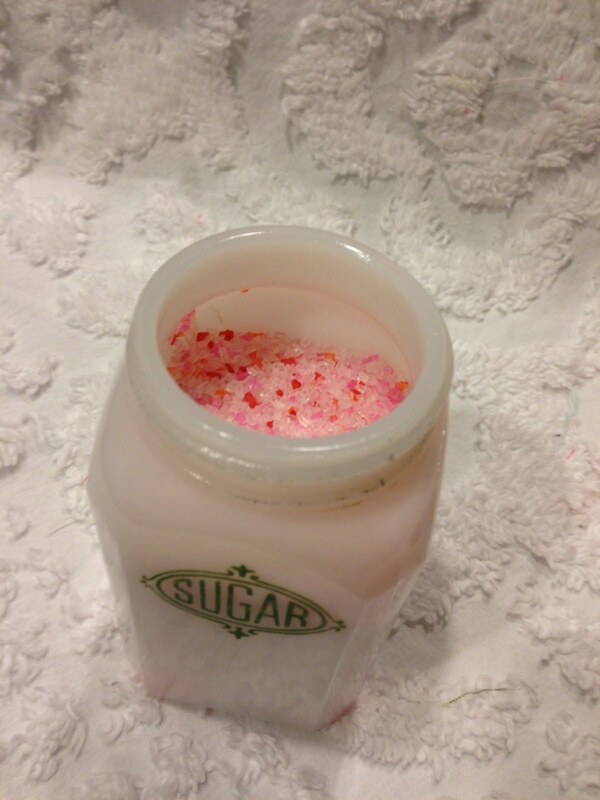 Inside the sugar shaker is red and white sugar for topping cookies or cupcakes. 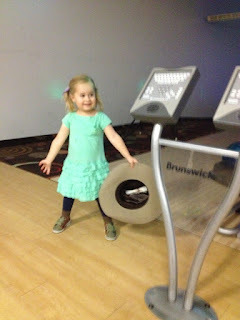 I think they will be fun for her to use - because she is very crafty, a great baker, and knows just how to add that special touch to everything she makes. This is a re-purposed gift bag. I know she won't mind that. It is too cute to just have gone around 1 time. I used the towel as my tissue paper, added the little sweets to the package. 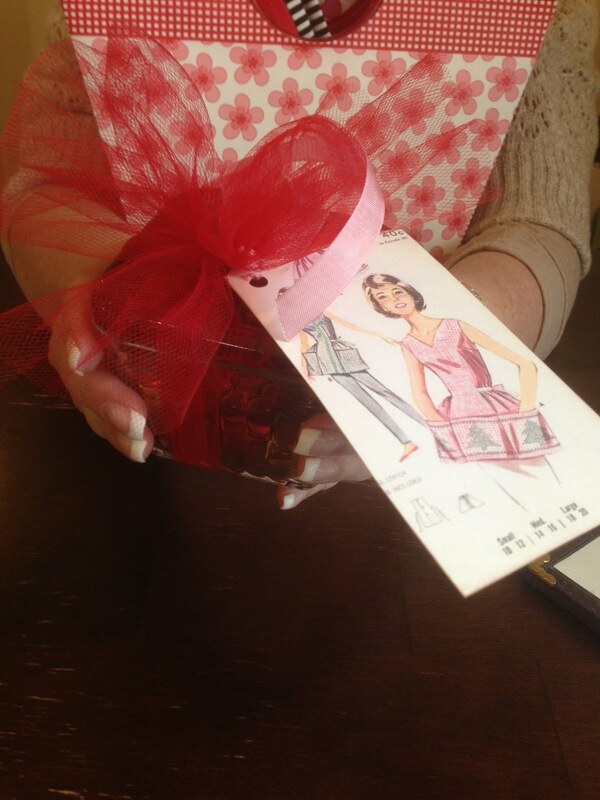 The final touch was the valentine tag. I think she'll like it. Who is my valentine friend? Of course it is Lori. 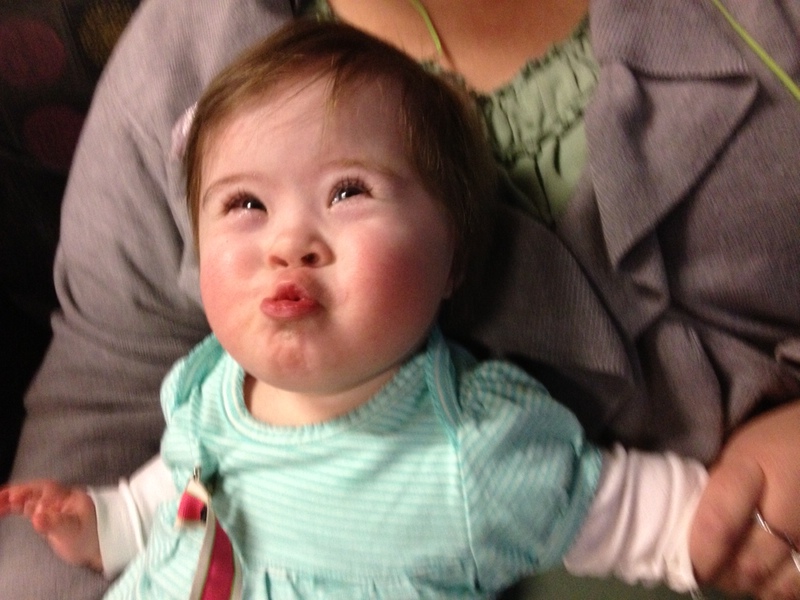 Her birthday is Feb. 16. I think that is why red is her favorite color.